When I saw these Magical Thinking Henna Letters from Urban Outfitters, I instantly knew I wanted one. When I looked at the price tag, I instantly knew I could make it myself for much cheaper. Odds are you have one or more of these supplies in your house already. You know that creepy part of your basement that you avoid at all costs? I would bet there’s a can of wood stain back there just waiting to be found. You really save money doing this project yourself if you want to make more than one letter. 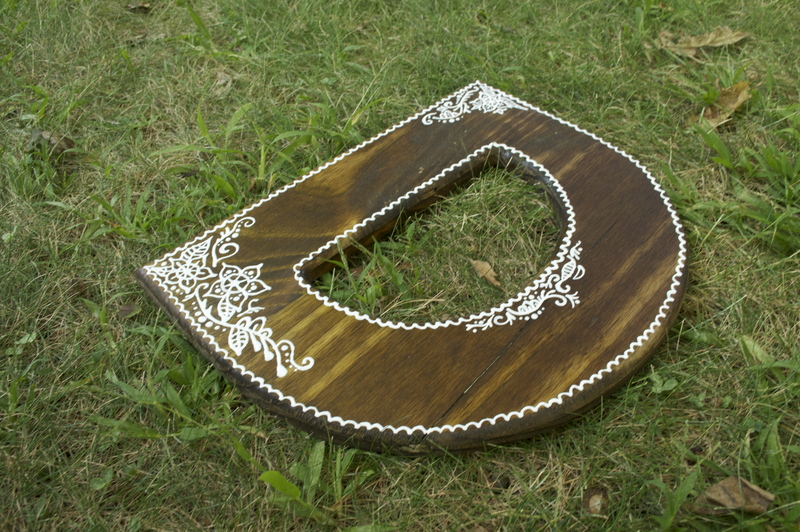 To spell out a word could easily cost more than $60 at Urban Outfitters, but once you have stain and 3d paint you can make as many wooden letters as you want for less than $5. 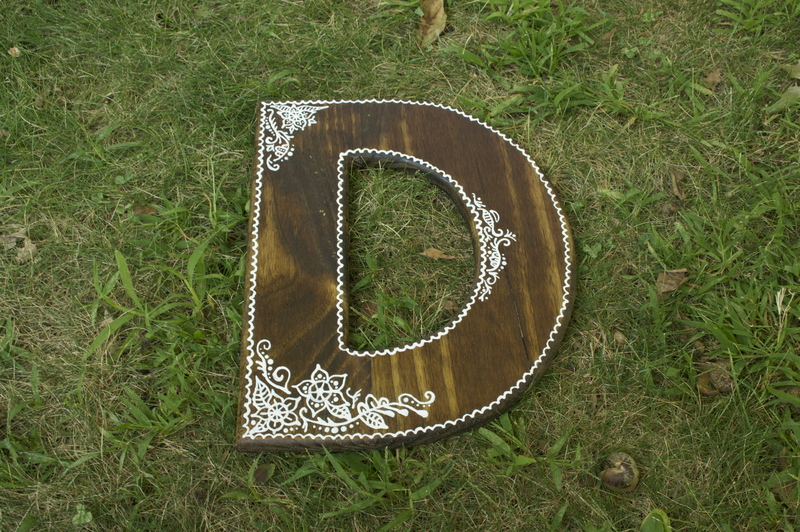 The first thing you need to do to make these letters is apply the stain. 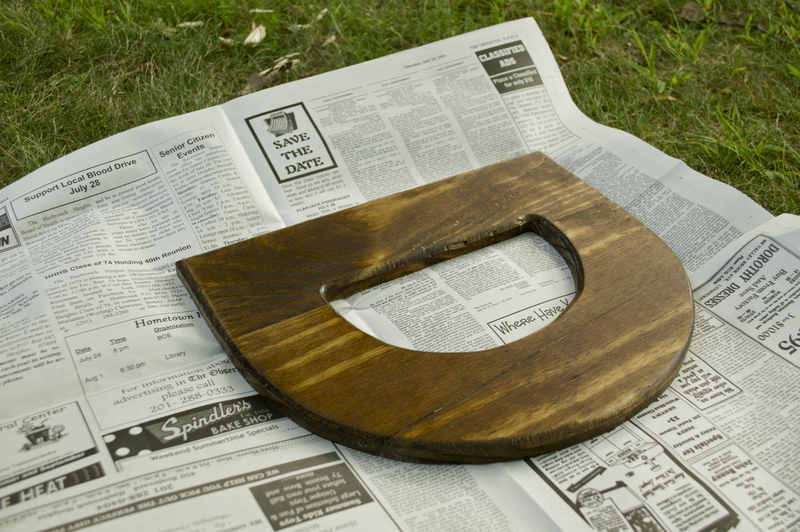 If you’ve never worked with stain before, I recommend working outside if possible. This stuff is stinky, so you may not want to fill your home with the fumes. Apply a thin layer with a paint or foam brush, and remove any excess stain with a clean paper towel. Once it’s dry (check the directions on the can) flip it over and repeat the process on the other side. You can add as many coats as you want until you’ve reached your desired color. Once the stain is dry, the next step is adding your henna-inspired art. For some simple henna designs check out this link. If you’re not comfortable free-handing the 3d paint, draw your designs in pencil first. It is much easier to remove pencil marks than textured paint once it’s on the wood, so you can’t go wrong by sketching out your design. Next simply trace over the pencil with the 3d paint. Once the paint is completely dry, voilá, you’re done! Such a great idea, and so cost effective too! We’ve been searching for something similar to this for our new house, I don’t know why we didn’t think to make them! Love, love, love the idea! Thanks for sharing!